This webcam takes static pictures every hour and offers the visitor the ability to view webcam shots takes in the previous 9 hours. 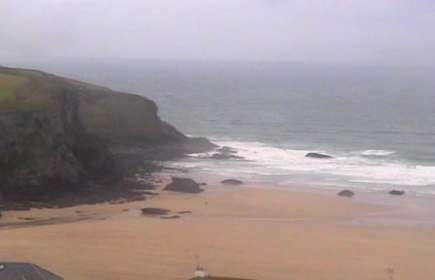 The webcam overlooks Mawgan Porth beach on the North Coast of Cornwall. Bedruthan Steps Hotel not only offers hotel rooms, but can also offer apartments that have sea views are are next to the main hotel. Villas are also available at the Bedruthan. As of 2008 the Bedruthan Hotel boasts a new spa offering a range of therapies and indoor pool. For more info on the Bedruthan Hotel and to view the webcam please visit their site.